A private picnic for two or a sunset-stroll on the beach – Cape Town is the most idyllic location to spend quality time with your other half. What sounds more romantic than wine tasting or champagne and nougat pairing in the Cape Winelands? With so many romantic 5-star activities, the Mother City gives other international destinations a run for their money. For the courageous couple, Shark Cage Diving excursions and Tandem Paragliding can be a lot of fun. Cape Town also features stunning hiking trails for beginners and advanced adrenalin-junkies. Discover a scenic selfie location and take a few snapshots – you would want to cherish this memory! Another great idea is to hike Lion’s Head by moonlight. What can be more romantic than a hike under the full moon and starry night sky? Live Jazz events are hip and happening in Cape Town. The Cape Town International Jazz Festival takes place annually in the Mother City. Not in town for this event? There are plenty of locations in and around the city where you can indulge in a gourmet meal while listening to some soulful beats with your partner. Open-air cinemas are your new best friend. During the summer months a lot of wine farms host movie nights. Pack a blanket and curl up next to your favourite person while enjoying one of the classics. The Centenary Tree Canopy Walkway at Kirstenbosch Gardens is a walkway which takes you from the forest floor into the trees. At the end you will be rewarded with an amazing panoramic view over the mountains, Kirstenbosch Garden and the Cape Flats. Kirstenbosch is a superb location for a romantic picnic – but be sure to check out the summer concerts taking place from late November until mid-March. If you want to sit, relax and enjoy the scenery with your partner, a sunset cruise is one of the most romantic things to do in Cape Town. 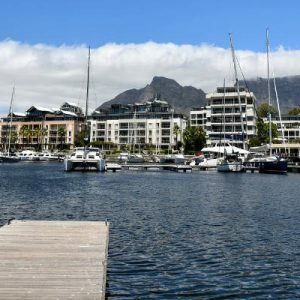 Leave from the V&A Waterfront and watch the sun set over the clear waters as you exit the harbour with a sundowner in your hand. Watch the beauty of Cape Town, Table Mountain and harbour unfold in front of you and seal your sunset cruise with a kiss.